Yesterday we talked about all the flowers and foliage you could photograph at the Cincinnati Zoo and Biological Park. Today, we’ll make a weekend out of this destination with additional activities not to be missed. 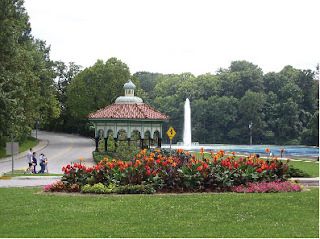 If you didn’t see enough flowers at the Cincinnati Zoo, why not try Eden Park this spring? Eden Park has a beautiful gazebo to a serve as a focal point. Be sure you don’t miss the Hinckle Magnolia Garden with its great fragrance. The Cincinnati Art Museum and the Cincinnati Playhouse are also located in Eden Park. Eden Park is also home to Krohn Conservatory. This architecturally significant structure houses a variety of eco-systems from rainforest to desert. When you’ve worked up an appetite with all that walking, head over to Zip’s Café. The Ohio Official State Trip Planner recommends it as one of ten “best dining on a dime” locations. Try their Zip’s Burger for only $4.50. Winner of ten “Best Burger and Fries” awards from CityBeat, they’ve got it down pat. For other dining recommendations, check out the Examiner’s in-town reviews on other establishments.